You're standing in the middle of an agility course. You're dog is running back and forth at your feet, barking in frustration. You feel your mouth go dry. Your vision swims. Your heart starts racing. You turn in a circle, looking hopelessly about you. 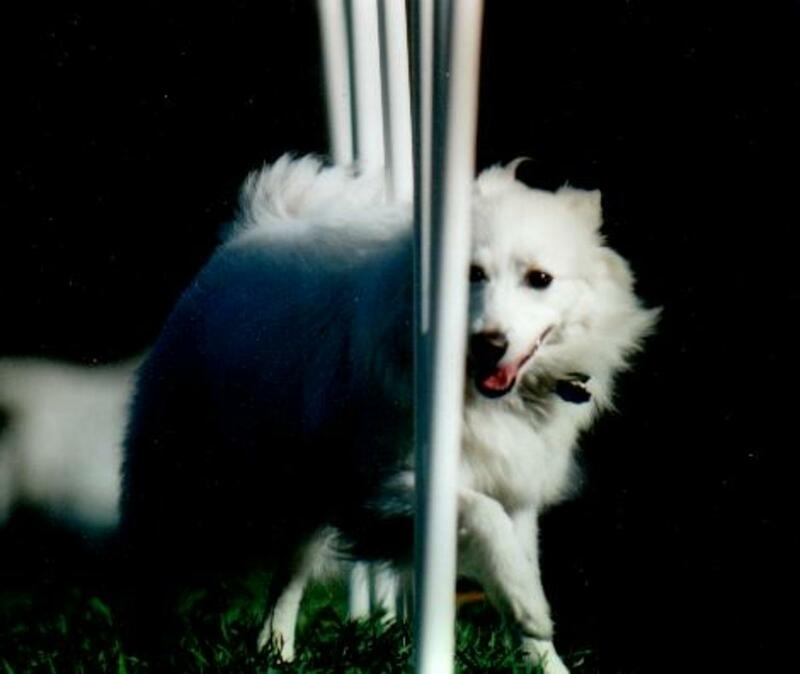 Obstacles seem to be taunting you, each calling you to send your dog to them. You just can't remember. Which is the next obstacle? You desperately try to read the numbers, but before you can figure out where you are on the course, your frustrated dog has gone out on her own, taking wrong course obstacle after wrong course obstacle. You've earned another NQ because you got lost. Again. 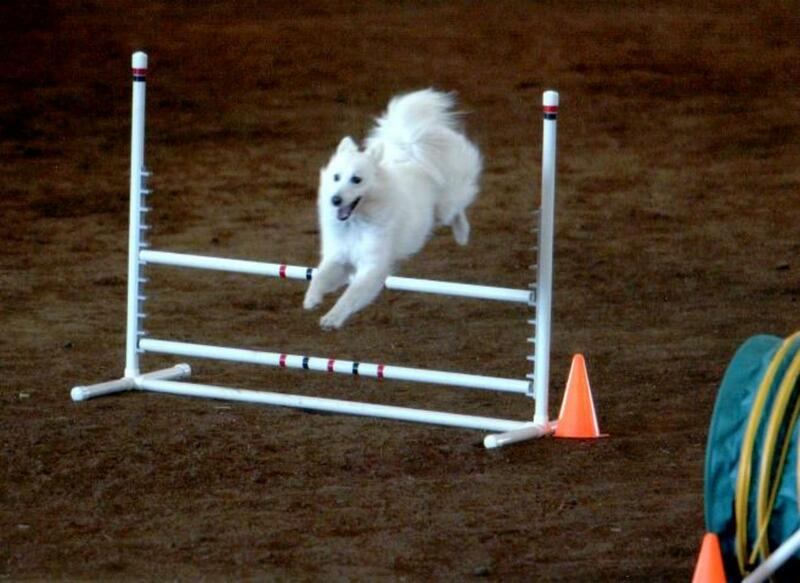 Many people struggle memorizing agility courses. The ever twisting, turny courses can be very difficult to remember. Put these twisty courses in a jumpers course where all the obstacle look alike, and getting lost can be a regular occurrence. Here is help for those directionally challenged among us. Below are six tried and true tips to help your course memorization. It doesn't take a rocket scientist to know that it's easier to memorize four or five things verses 18 - 20 things. 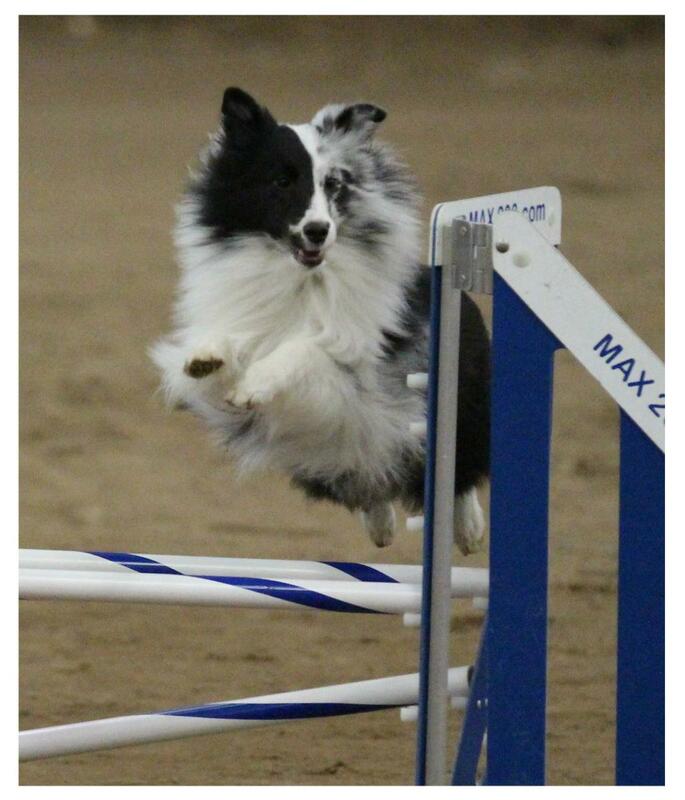 If you are memorizing an agility course obstacle by obstacle, you are doing it wrong. Handlers that are memorizing "Here's the first jump....here's the second jump....here's the third jump..." are doomed to eventually fail. Rather than memorize each individual obstacle, memorize the pattern the course takes. Look at the course map above. There are 19 obstacles on this course. Rather than memorizing 19 different things, you can memorize patterns, and reduce the number of things to remember from 19 to just four. #1 - The big loop from the start to the teeter. #2 - The small loop from the teeter to the table. #3 - The small loop from the table to the weaves. #4 - The turn to the last jump. One place many exhibitors get lost is when a course doubles back on itself as this one does from obstacles 10 - 16. By memorizing the PATTERN rather than the obstacles, you can easily avoid getting lost on courses that double back because your only memorize a couple things verses many obstacles. Here, you're only memorizing the first loop as the teeter to the table. The second loop is the table to the weaves. That's two simple loops. You aren't memorizing jump #10 to jump #11 to jump #12 to the table to jump #14 (which is also jump #11) to jump #15 (which is also jump #12) to jump #16 (which is also jump #13). Whew!! Which is easier to memorize? Two loops or all of those confusing jumps!!! You can see how easy it would be to get lost memorizing each obstacle verses memorizing four simple patterns. 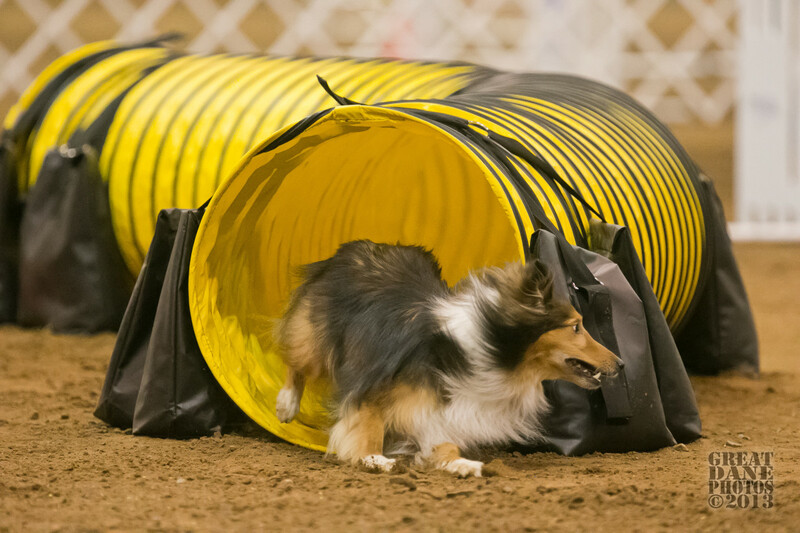 If you don't know what dog agility is, you might enjoy reading the article "What is Dog Agility: Agility Information for Newbies" by Agilitymach. 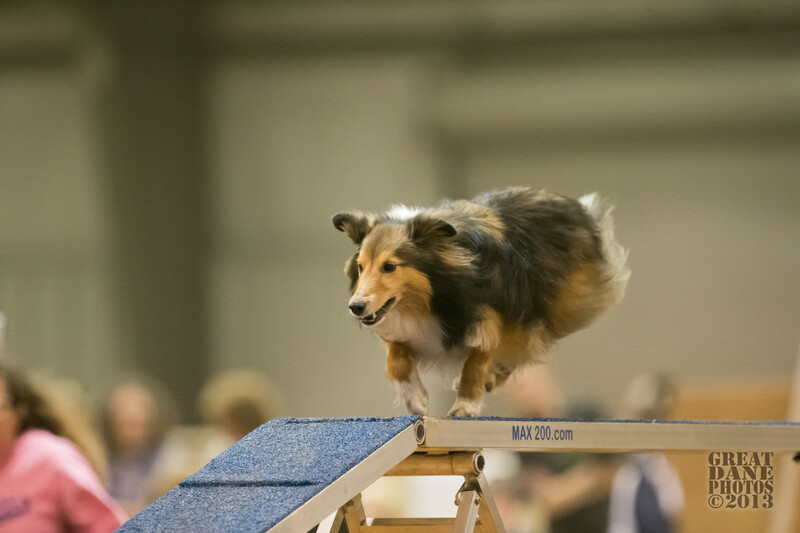 It will explain some of the "lingo" used in dog agility, and give you a quick overview of this exciting, fast-growing canine sport. This tip is a bit obvious. Get the course map, draw the dog's path, figure out the patterns you'll need to memorize, and start memorizing. You can sometimes get in hours worth of memorization before you even begin your precious minutes of walk-through time. Different people have differing capabilities when it comes to being able to read a map and transfer that to reality. However, by taking an agility map and looking for the patterns, you can at least be able to see what patterns you will be facing. 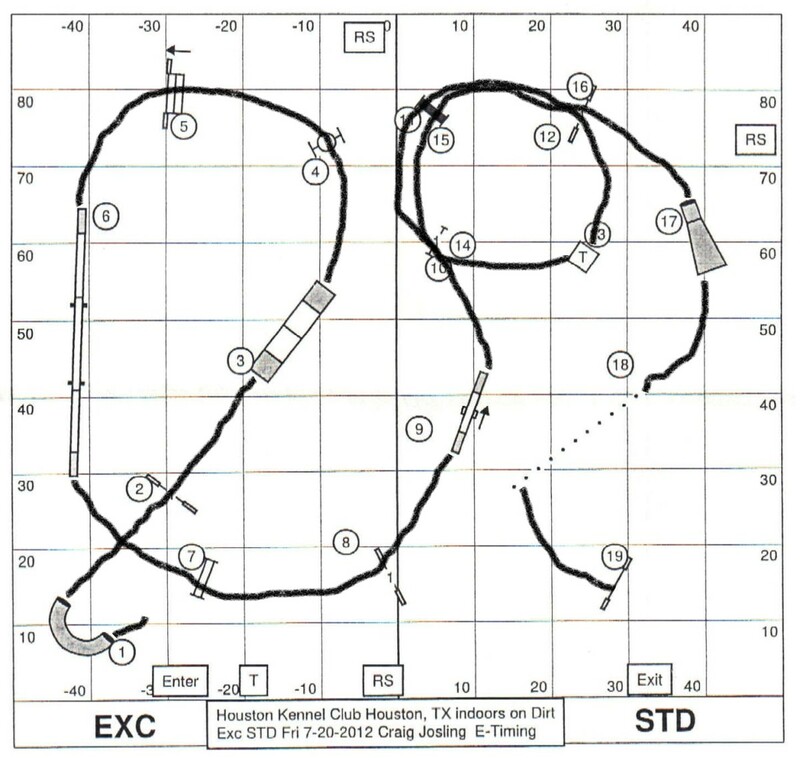 For instance, with the course map above, you can see there is a big loop, two small loops to a turn to the last jump. This information is invaluable. You can then easily memorize those patterns before you begin your walk-through where you can figure out the rest of your handling strategy. Don't skip the map. Use it. Begin memorizing your course early, and then you'll be ahead of the game before your walk-though even begins. 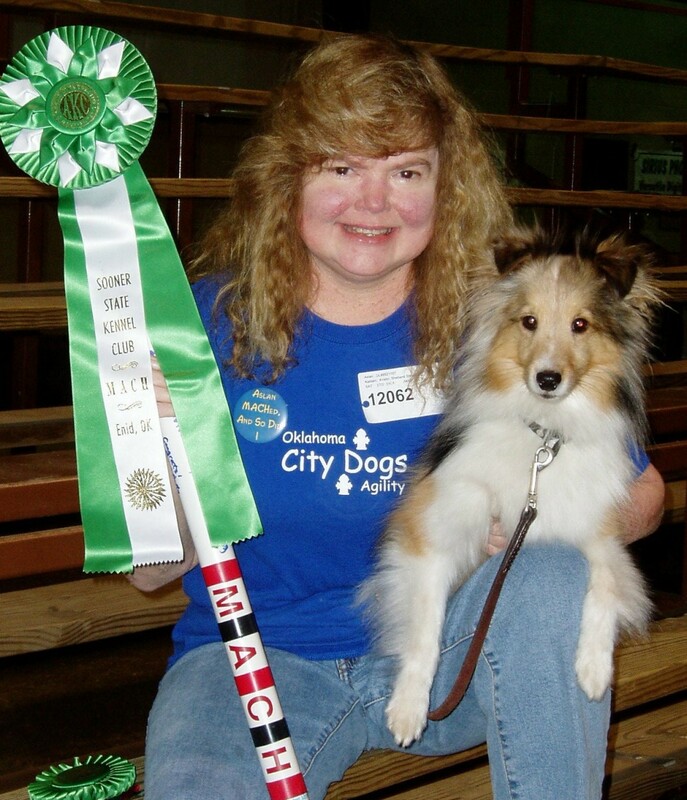 Years ago, one of my teen agility students commented that she would never want to look like the adult handlers as they walked the course without their dogs. "They look like zombies," she said. Sure enough, handlers walking a course do look a bit like zombies. (See video above-right at 41 seconds.) The smart handler, though, embraces her inner zombie and uses the walk-through time efficiently. Stay focused during your walk-through. Don't let distractions pull your focus from your job at hand, which is memorizing the course and your handling strategy. Talking to friends is great, but walk-through time isn't the best place to chat about your last run. If course memorization is hard for you, it may not be the best place to be chatting about your friend's handling strategies either. The walk-through is YOUR time. You do not have to share it with others. These are your precious minutes to focus on memorizing the course. You should be feeling the flow of the few patterns you will be memorizing. You should be studying handling strategies for your team and choosing the right moves for your dog. You shouldn't be involved in club gossip or yucking it up with your peeps. If your friends are causing you to be distracted by trying to talk to you during walk-throughs, then invest in a pair of earbuds. You don't even have to plug these into a device. Just put them in your ears. Everyone understands the "earbuds in use" sign is the universal agility signal for: "Please leave me alone during the walk-through." It's a polite way of telling people you want and need to focus. And, if music helps you focus, then actually plug the earbuds into a device. 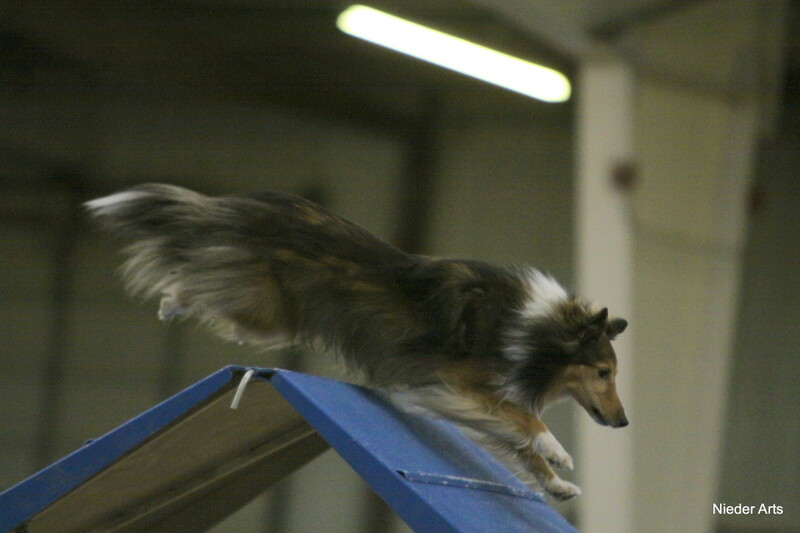 At my first Agility Nationals (video above), I was stunned at the level of quiet I heard during the walk-through. Nobody talked. It was serious business out there. Everybody was focused and in their heads as they planned out their strategy and memorized the course. If memorization is a problem for you, then you should be treating every walk-through like it was a walk-through at Nationals. Get those earbuds and put them in your ears. Spend the minutes on the course in deep focus - not in friendly chit-chat. When I memorize a course, the first thing I do is get a course map. I spend time memorizing the course on the map and planning a potential - but flexible - handling strategy. When walk-through time comes, I already have the patterns memorized, and all I have to do is feel those patterns in real space. After feeling that spacial reality and learning my handling strategy, I then head over to the side of the course, close my eyes, and start looking a bit like a blind zombie walking in circles. What I am doing standing at the side of the ring out of walk-through traffic is making sure I have the course memorized. I am rehearsing - in a small space - all of my handling options. I will continue to work on memorizing the course until I can, over to the side, "run" the entire course in my head with my body pantomiming the crosses, serps, .pushes, etc. that I'll need to communicate the course to my dog. When I can do this at speed with my eyes closed (no peeking at the course for help! ), I then know I have the course memorized. One of my personal pet peeves at agility trials are those who want to chit chat with me at the start gate. When I am standing near the start gate with my dog, I have a job to do. Actually, I have many jobs to do. I'm juggling developing a communication bond with my dog; warming up my dog and myself; watching the line up so my timing for my treats, warm up, etc. allows my dog and I to enter the ring at peak preparedness; and I'm being the "Zombie in Pantomime" again, rehearsing the course and my handling over and over and over. After doing your "Zombie in Pantomime" routine during walk-through, you will need to repeat that many more times before your run. This will help keep that information fresh in your short term memory. By ignoring these all important mental run throughs, you are allowing your walk-through memorization to slowly leak away from your short term memory. At the start gate, I will put my dog in a sit/stay, shut my eyes, and go over the course - with pantomime - two to ten times, depending on how well I feel I have the course in hand. People who are chatting at the gate are ignoring all of those important tasks in which they should be engaging. Building the communication bond with your dog, building your dog's focus and drive to just the right peak for your ring entrance, warming up your dog and yourself, and all the while continuing to keep the course and your handling details in your head are what the start gate is all about. Chit-chatting can wait for after the run. Practice makes perfect, right? Practice at home memorizing course maps and doing the zombie pantomime in your living room. 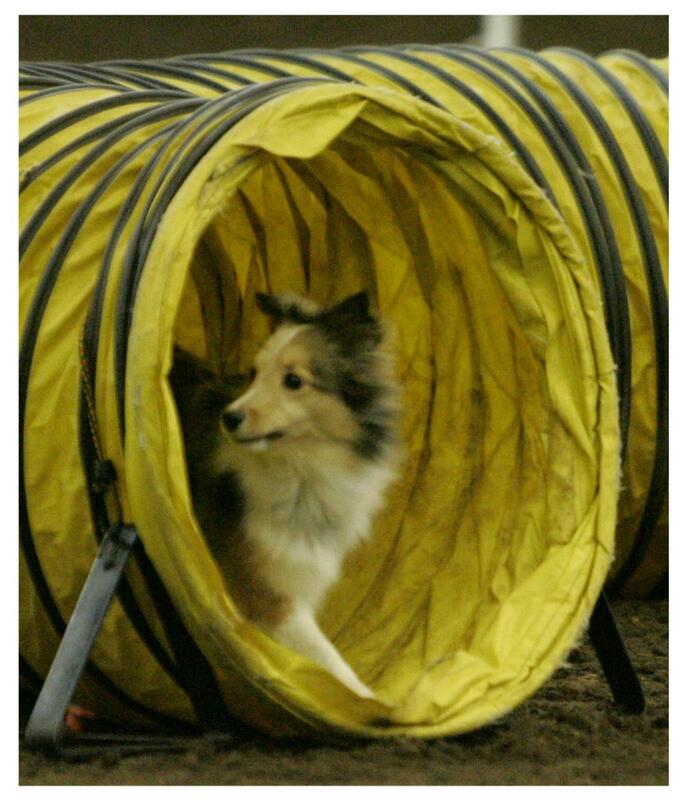 There are agility courses all over the internet. Google "agility course maps," print off some maps and bring the agility zombie dance to your living room. Can you memorize a map with the zombie pantomime, wait for 10 minutes without thinking about it, and still be able to "run" the course in your head? Practice like this may feel silly, but training your brain to memorize patterns and handling strategies is an important part of the game. And please, video yourself doing the zombie pantomime, upload it and share the link in the comments below. We'd love to see it!! 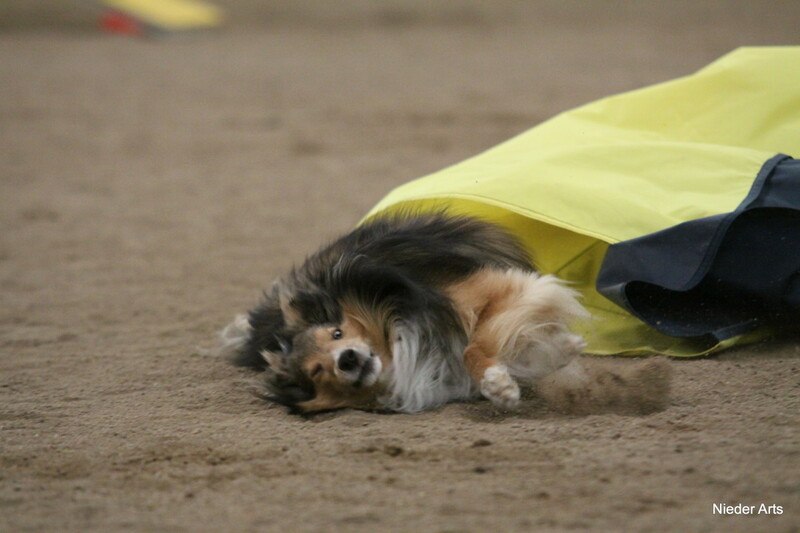 To deal with anxiety at dog agility trials, I developed my own 5 point mental toughness program based on Lanny Basham's work. Lanny Basham is an Olympic Champion. when he first started competing in Olympics he was not prepared for the stress he felt. So he developed a program to control the stress. 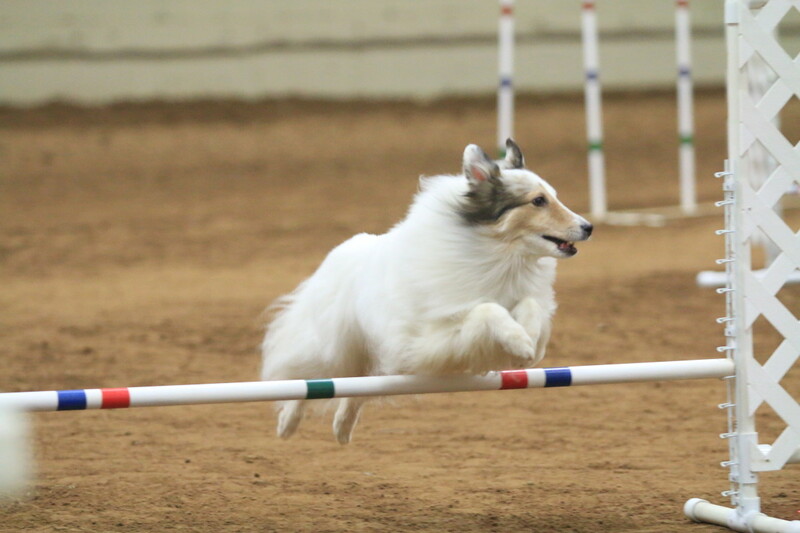 If you see me giving "secret" baseball coach like handsignals to my Sheltie as I walk out or dance out from the startline, that's part of my mental toughness program! Very good advice. I really make use of the course maps at trials. Unfortunately, I do some NADAC trials and they do not provide course maps as do AKC, CPE, and TDAA. Not sure of the reason. My pen gets a real workout drawing lines on my maps! If you have fun and treat an agility training like dancing, it will come naturally. Through consistent practice you get to "dance" the next step, as if following your inner choreography. Great points in this hub! In my area of the country, almost all the trials are indoors. Here, we compete on packed dirt, soccer turf ot more rarely, mats. Some areas of the country compete outdoors with many indoor trials too. Outdoor training facilities usually are on flat surfaces with short grass. For instance, an electric wheelchair could navigate in my outdoor agility field. In the northern parts of the country, moat training facilities are indoors. In the south, there are still many indoor facilities. You will need to do some research and see what is in your area. 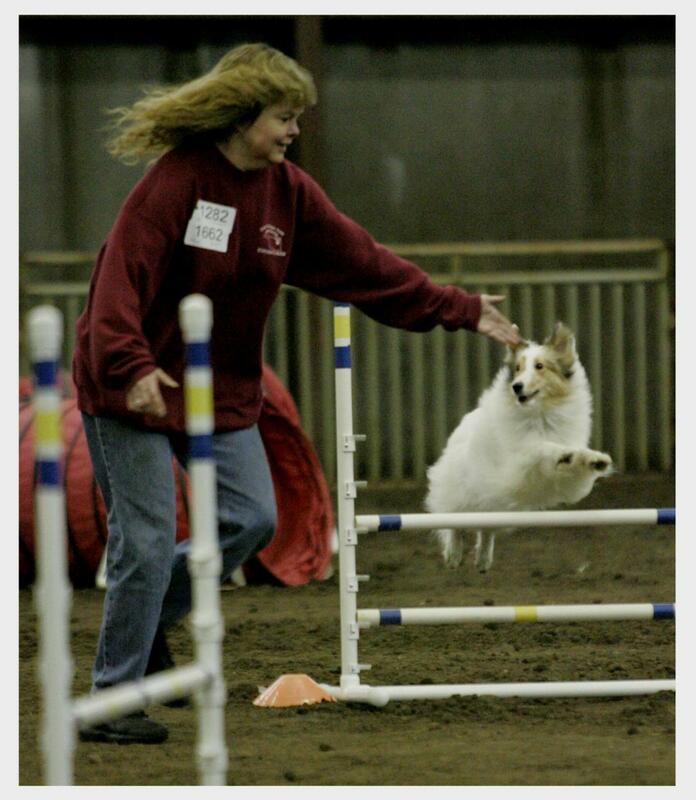 You may want to check my award winning article on finding the right agility trainer for you, and if you haven't, check out my article on being competitive in agility in spite of physical limitations. There are great agility teams out there with handlers in wheelchairs. Go have fun!! I will try to remember that! Thanks! I am getting better, but have my moments. Thankfully she's pretty good at reading non verbal cues - sometimes this is good, sometimes bad if I'm unsure. Last time I planned a rear cross, started executing a front cross, remembered I wanted to rear - she took the jump, made the U-turn and somehow located the chute- how we Q'd is beyond me but we did! I control my nerves by actually using them in competition. I realize nerves are my friend, and work to incorporate them in my run by using the "fight or flight" instinct to "fight." This helps me actually control my nerves as I put them toward "fighting" and "attacking" the course with precise timing of non verbal and verbal cues (including proper acceleration and deceleration when needed). At big events when I feel my nerves getting the best of me, I remember to try and incorporate that overwhelming feeling into the "fight." This usually helps me, but I do not suffer panic attacks. Try this concept and see if it helps at all. Experience should help as you adjust to the concept of showing. Good luck!! Memorization isn't a problem - panic attacks during my run are. Experience, I'm hoping, will cure that. We are running Excellent in AKC now. Thank you wetnosedogs!! I enjoy your hubs too. :) Thanks for dropping by and reading. Oh well, you cured me. I would get lost for sure. LOL. Actually, very happy to read this. There is more that meets the eye and you always make your hubs so interesting. We are not agility, but I do enjoy your hubs. Wonderful hub. I wish I had entered my one dog, a duck toller, into agility training. She's a rescue so not sure of her age-but she's somewhere between 10-12 and still needs CONSTANT exercise otherwise she becomes unbearable, however, she does arthritis (a little catch-22 there)! If I ever get another toller, I think agility classes would be the way to go!